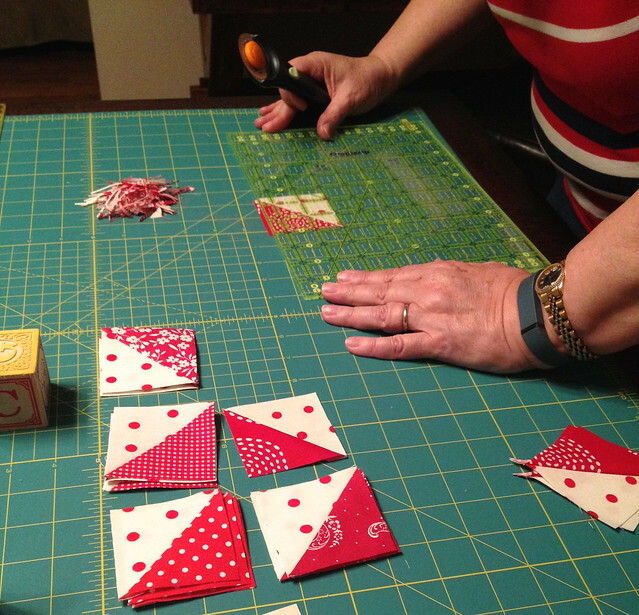 I had the opportunity to test a fun block for Diane of From Blank Pages. It is her brand new Star Fruit paper piecing pattern, and it comes in 6 inch, 12 inch, and 18 inch sizes. I chose to make a 12 inch finished block. 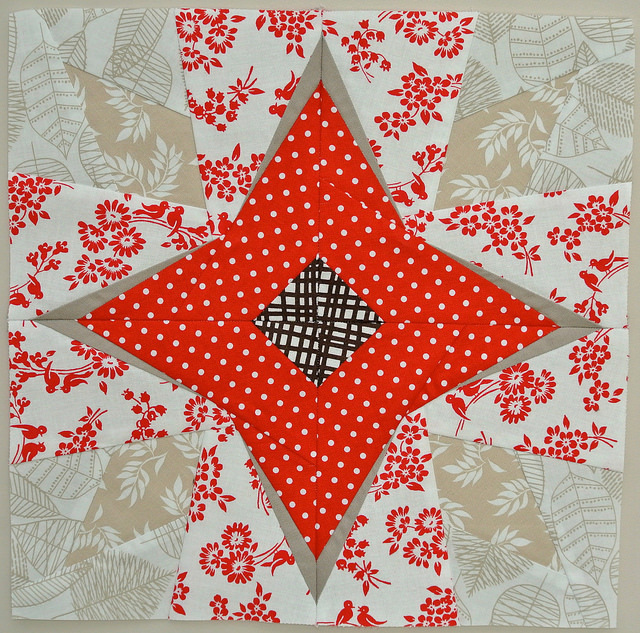 This pattern is not one to pick for your first time paper piecing, but it is a very do-able block for someone with a reasonable amount of paper piecing experience. It makes a really cool secondary design that I chose to deemphasize in the tan area, but it just depends what you want to do with it. 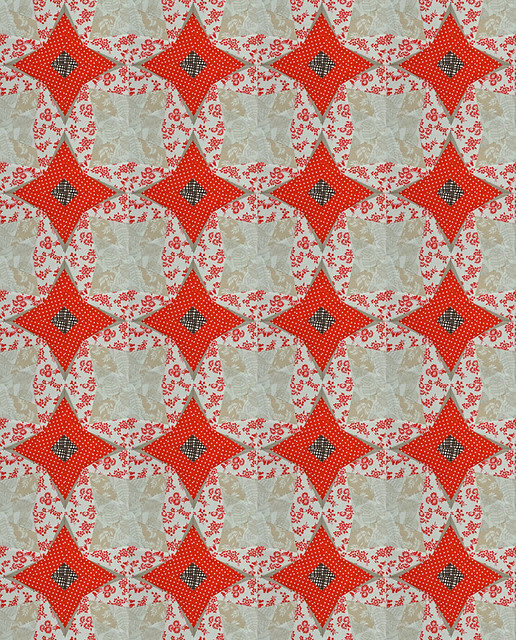 I decided to play around a little bit with Photoshop and see what an entire quilt made from this block would look like. First up is the standard, non-sashed quilt. 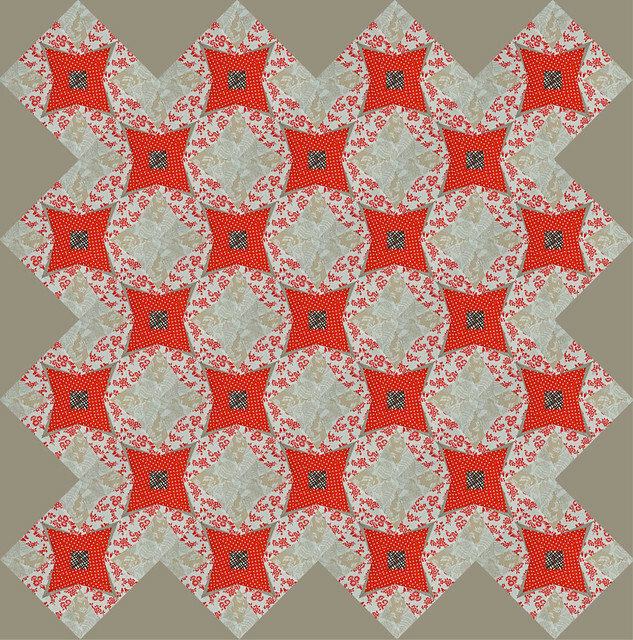 It makes some really nice secondary designs, and I think I would actually have an easier time deciding how to quilt an entire quilt of this block than I will when this is part of a sampler. I really, really like this block set on point! My husband saw this picture, and I think he wants an entire quilt made just like this. This quilt isn’t going to happen anytime soon, but I agree that it would be beautiful. 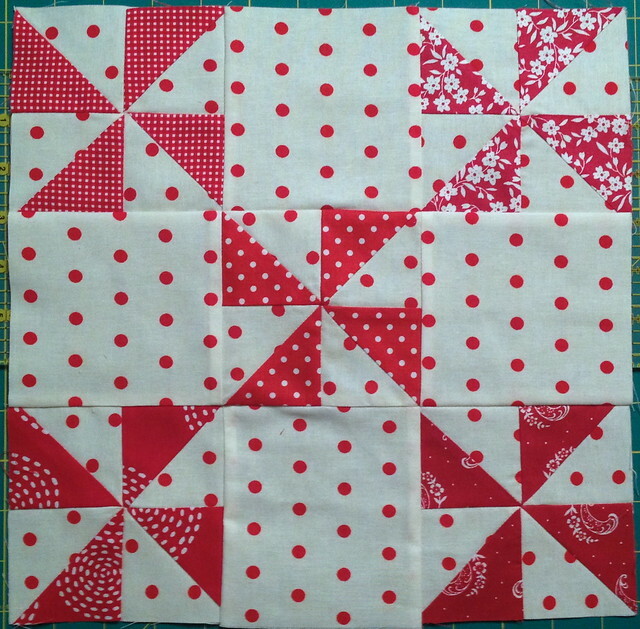 Lastly, we have how this block will actually be used – as part of my Real World Red and White Sampler. I’m up to 15 blocks! Exciting, because my goal is for this to be a queen (long ways off). This block is available on Craftsy or Etsy. Or you can leave a comment right here for a chance to win a copy! I will leave comments open through May 5th, and announce the winner on May 6th. Linking to: Anything Goes Monday, WiP Wednesday @ Freshly Pieced, Let’s Bee Social Wednesday @ SewFreshQuilts, Whoop Whoop Fridays @ Confessions of a Quilt Addict, Fresh Sewing Day @ Lily’s Quilts, Fabric Frenzy Friday @ Ft. Worth Fabric, Sewjo Saturday at My Go-Goo Life, Paper Piecing Party @ Quiet Play. 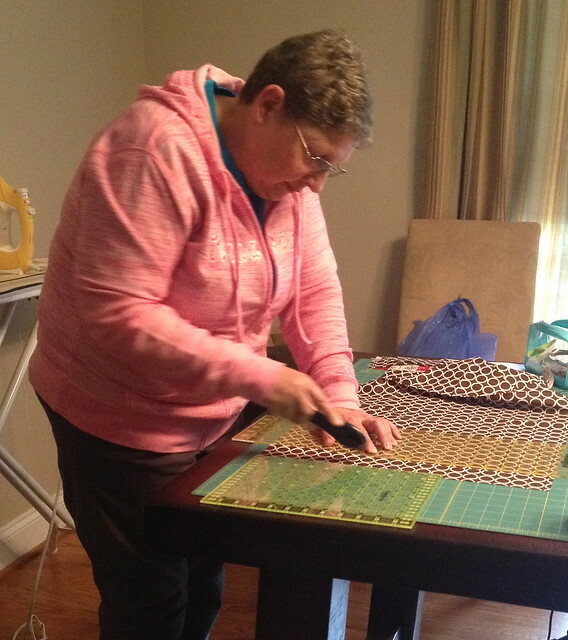 A couple weeks ago, I had the opportunity to do something different – I was teaching quilting to my mom. My mom learned to sew in the day of home economics for all girls, and made a substantial part of her wardrobe (probably from high school through her 20’s), so she is not new to sewing. Teaching someone how to piece quilt blocks is a lot easier when the person already understands what a 1/4 inch seam is and why consistency matters. 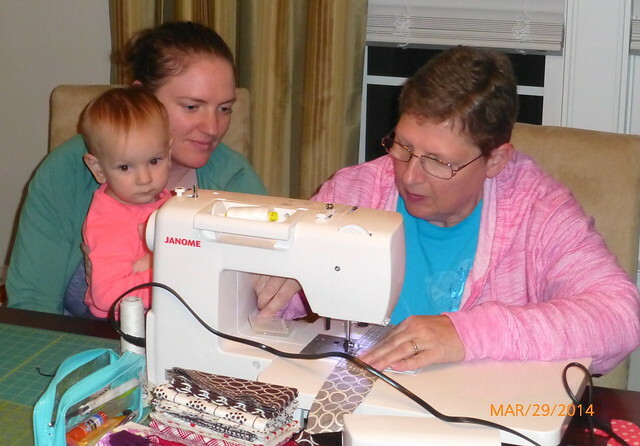 Three generations of quilters in action! My mom and grandma did make a quilt at some point before I existed. They used 4 inch squares of fabric leftover from clothes my mom made – a mix of fabric types. They cut it out using electric scissors, sewed it together, and tied it. My mom still uses it on the bed when my parents go camping. 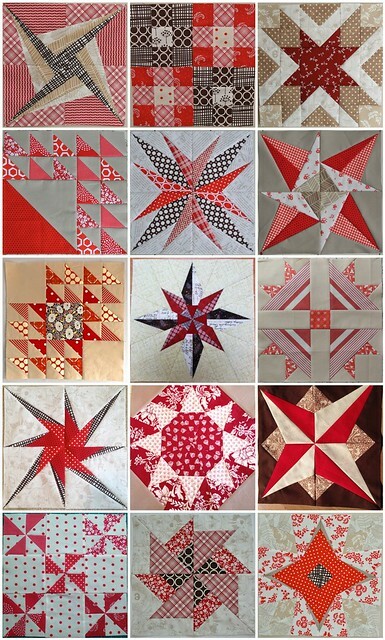 There are differences between quilt piecing and clothing sewing (or how she sewed when she did it a lot): seam size, using a rotary cutter, using 100% cotton fabric, pressing instead of ironing, etc. Either way, she was a fast learner. For her first block, I chose a block based on 9 patches. Straight lines in squares are always a good place to start. 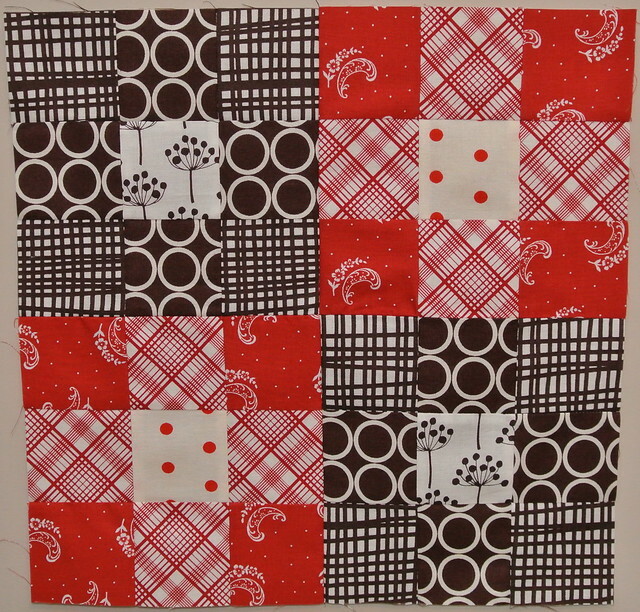 I did selfishly choose colors that would work with my “Real World Red & White Sampler”. We did the 9 patch block from Sewn By Leila’s We Can Do It! Skill Builder Sampler. For her second block, I introduced half square triangles. We did the Pinwheel block from the same sampler, which was really just adding some tips to the Pinwheel Parade Block by V&Co. My mom’s visit was great, and went too fast as always, but I’m glad we got to spend some time together doing something we both really enjoy.Linking up to Whoop Whoop Fridays @ Confessions of a Quilt Addict, Fabric Frenzy Friday @ Ft. Worth Fabric, Sewjo Saturday at My Go-Goo Life, Anything Goes Monday, Fabric Tuesday @ Quilt Story, WiP Wednesday @ Freshly Pieced, and Let’s Bee Social Wednesday @ SewFreshQuilts. 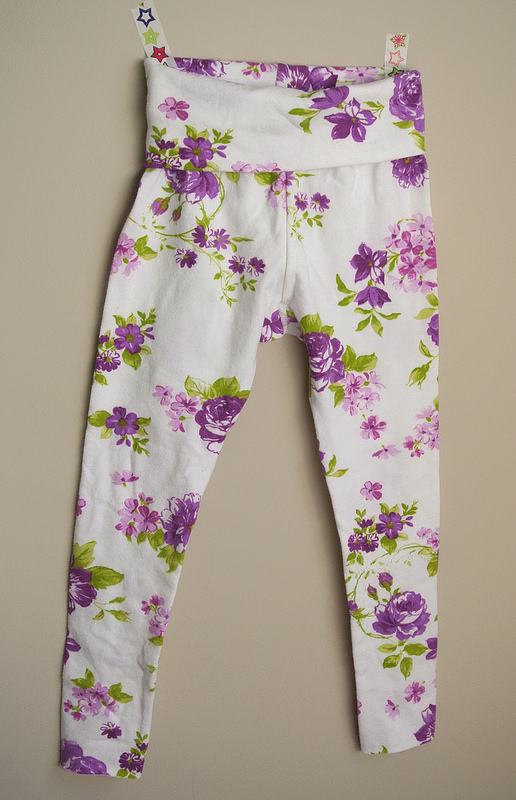 For this spring version of Kid’s Clothes week, I made the Apple Loungewear Leggings. It was 80 this weekend in my part of North Carolina, and Monday it was rainy and 45 degrees. Then again today, was mid-60’s so the weather is just crazy. 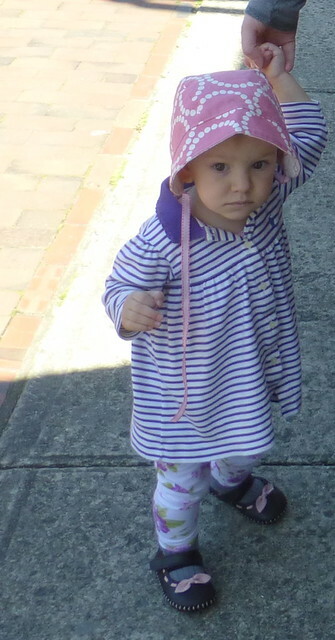 Either way, summer is not yet 100% here, so the little girl needs leggings. Pattern: Apple Loungewear Leggings by Shwin Designs, purchased end of November and finally made. Sizing: The sizing was chart was pretty good. Technically, she would have been in the 6-9 month waist size, but I’m glad I sized up to her RTW size. These fit more comfortably, and will be worn longer. My daughter is a tall, thin 14 month old and these leggings fit her incredibly well. The length is good. Most purchased pants are too short on here, and they would not have needed the extra length I added. The leggings even work well under a dress, especially for a new walker that still trips occasionally. Fabric: Purple floral purchased from Girl Charlee forever ago, so it looks like they no longer have it. It’s a fairly substantial knit, I didn’t write it down but I’m guessing it is at least 8 oz, maybe 9 oz knit. It is a great weight for leggings.Instructions: These leggings have three pieces, and are incredibly easy to construct. They are a super fast sew. Overall Impression: I like these leggings, and plan to make more pairs. I wasn’t sure about the fold over waistband at first, but it fits right under her toddler tummy and helps keep the pants up without requiring elastic in the waist. This pattern is a winner! Linking up to Anything Goes Monday. Welcome from April Fresh Sewing Day! Below are my March Projects, with links to the posts with more information. While you are here, please look around and follow me if you like what I see. 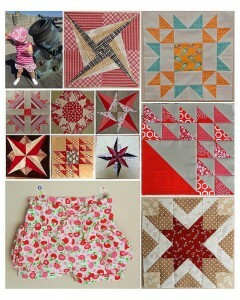 I do a lot of piecing and quilting, and make clothes for my 1 year old daughter. 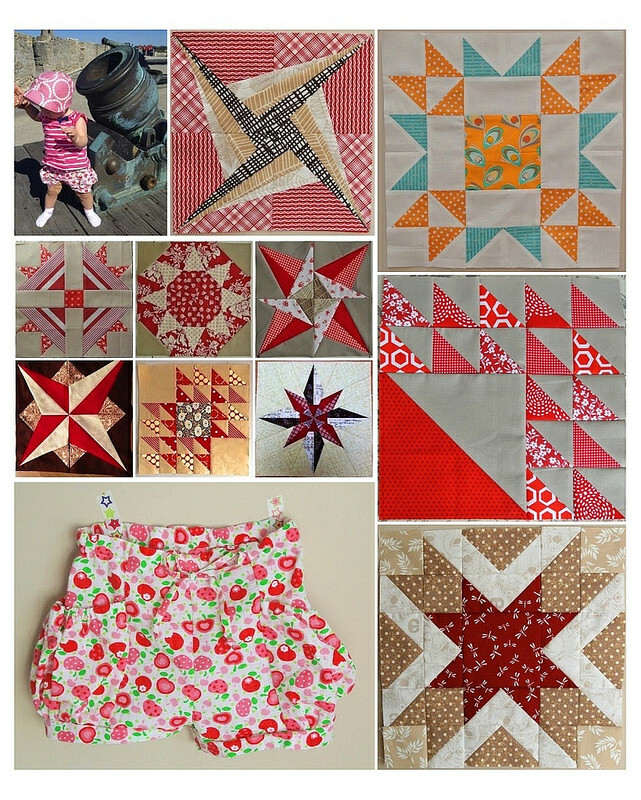 Linking up to Fresh Sewing Day @ Lily’s Quilts.